April | 2015 | Azazel's Bitz Box. Yep, there are some “mistakes” and missing bits there. MD8 Skull Chucker as it arrived. First and most obviously, the crew are “wrong”, and it’s missing the Skull Ammo Pile. 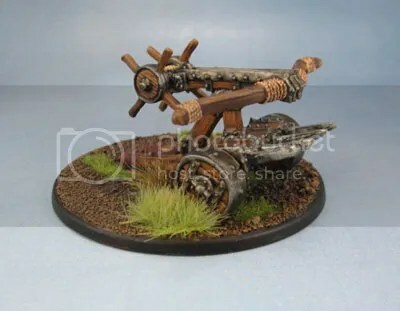 It was sold on eBay with two loaders and a spotter, but not the bonehead who fires the catapult. 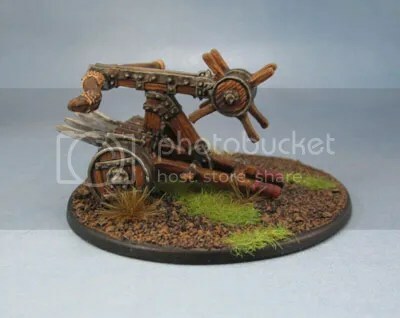 Still, the price was ok, and shipping from the UK was decent rather than exploitative (both real concerns when you’re here in Australia) so I figured “good enough” and got it anyway. 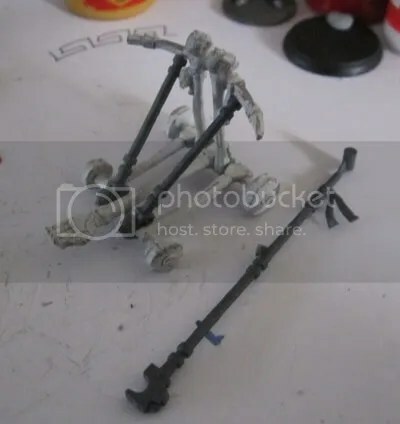 There was a ton of old superglue encrusted on the launcher arm and frame, and the arm was glued slightly up at an odd angle. Also a fair bit of old, old flash and extruded bits of lead to clean up. No big deal though. I used a bit of greenstuff to get a good bond when reassembling, and then noticed that both braces were missing from the kit. 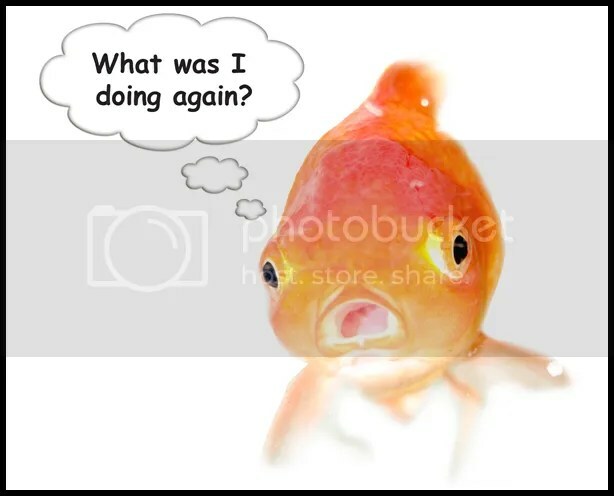 D’oh! MD8 Skull Chucker under repairs. 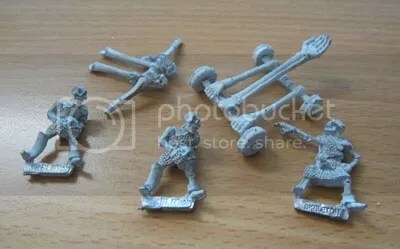 Now luckily I’d just bought some undead Tomb Kings stuff off a guy locally, and I’d literally just received the bag of bits that he’d “forgotten” (cough) to send out with the other stuff a week earlier. I thought it would be worth checking through to see if there was something appropriate in it that I could use to fix up the Skull Chucker. Now the bits bag was actually filled with cool bits (it was a big reason why I bought his stuff). and it included several of these …banner poles(?) After cutting them down, they turned out to be a great fit, and the socket cutouts with little embossed skulls on the joins worked perfectly as replacement pieces. I should make up a replacement Skull Ammo Pile. It was one of the first things I thought of, but I completely forgot about it until now. Shouldn’t be too difficult, at least. MD8 Skull Chucker – Repaired! They look like they’re supposed to be there, so as fas as I’m concerned, Job’s a Good’un. 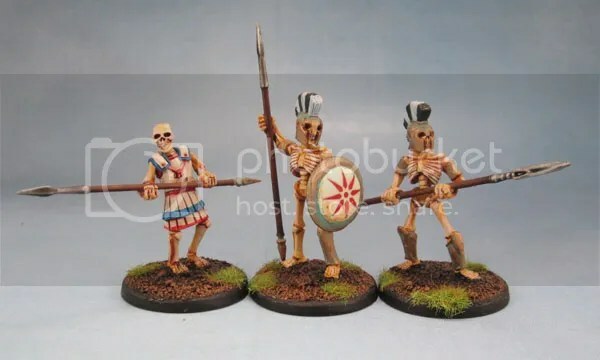 For the paint, I stuck to Marouda’s chosen Undead palette. Bone/Black/Brass/Iron with deep Red and some Aqua (verdigris) as the spot colours. My style of painting bone might be a bit bright to be properly realistic but it pops nicely on the table. The crew provided me with some stuff to work on at work last week. I’ll have to prepare some new models to work on for this week’s lunch breaks now. It’s like an extra deadline each weekend. Eurgh. Undead and Orcs. Back together for the first time in a long time. 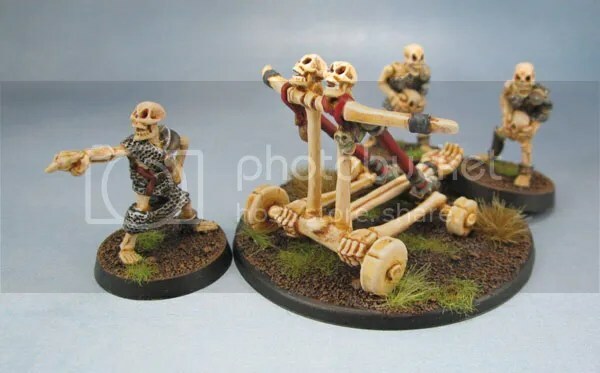 Back in 3rd Edition WHFB, I used to regularly summon Skeletons as allies for my Orc and Goblin army. 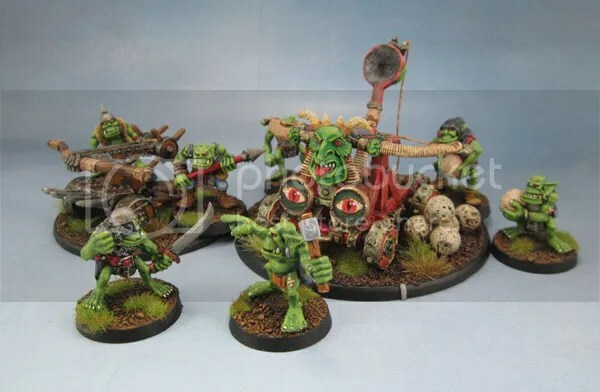 They often just stood in lines breaking up the line of sight between my Orc units so they wouldn’t kick the crap out of each other via failed animosity rolls. 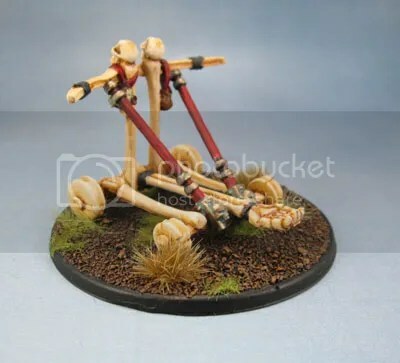 Now that’s something I don’t miss in KoW! I received my Reaper Bones II Kickstarter stuff a few weeks ago, and while I had a little bit of Buyer’s Remorse at not having purchased a few additional bits and pieces from the campaign, that’s mostly due to having started new projects that things would have worked well for in the time since the campaign ended, and then finally delivered however many months late it was. I didn’t even bother keeping track of that this time around. Overall it’s a solid bunch of models for PVC, and I picked out a few that I thought would make nice, quick painting projects. The first was that Bronze Bull/Brass Bull/”Gorgon” which I asked about recently and just need to finish the final touches on (probably later this weekend). The second and third are these two …thingies. 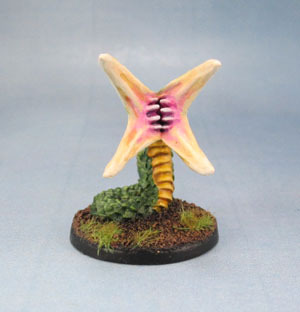 …and now for your clothes, here’s a pretty flower. 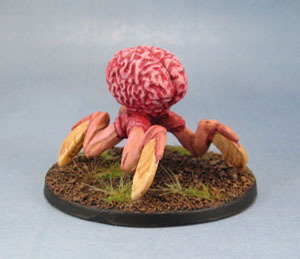 Now, my nerd-background is solidly on the Warhammer/LotR side rather than the D&D side, so when I saw the 03603 “Cython” and 03582 “Mind Eater”, I saw silly-weird Rogue-Trader-esque space aliens, rather than D&D critters, and decided to paint them up in that spirit – somewhat inspired by Cheetor’s Alien Flora and Fauna project (and the fact that they looked like they’d be quick and easy enough). So in the spirit of all that, I thought I’d paint these suckers up. 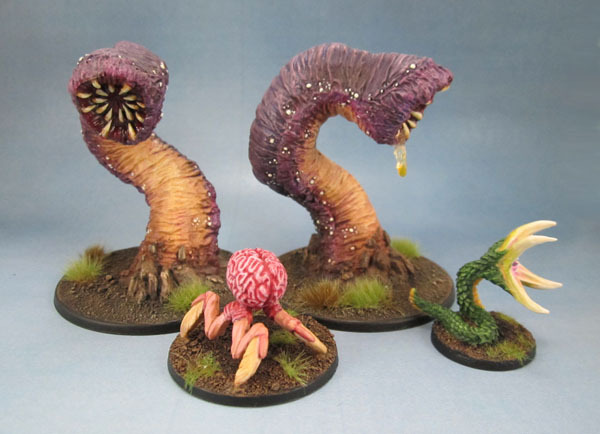 Knowing that of course, the things must be some kind of D&D or Pathfinder ripoff, I also asked Tarmor if he knew what these things actually not-are. 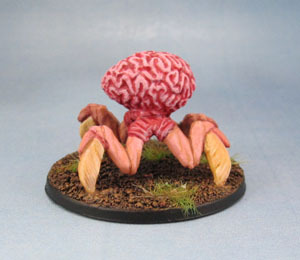 He informed me that the 03603 “Cython” looks a lot like a Grick from 3rd edition D&D and that 03582 “Mind Eater” is a direct “copy” (ripoff) of an Intellect Devourer from all editions! Tarmor also kindly provided me with a couple of pictures that I then used as paint references. 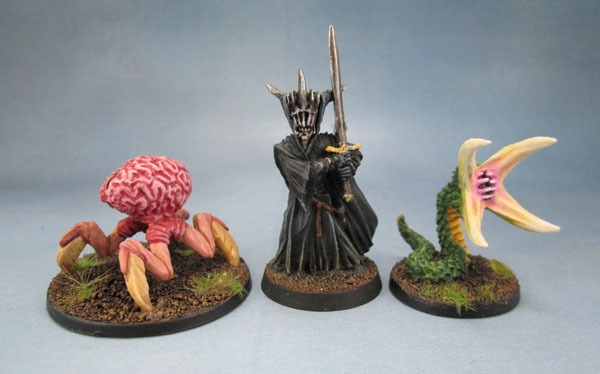 Now that I’ve done the photography, I’ll be adding some Gloss Varnish to the Brain Diner, and these two will be done and dusted. The Mouth of Sauron provides Scale. The Mouth of Sauron provides scale reference. 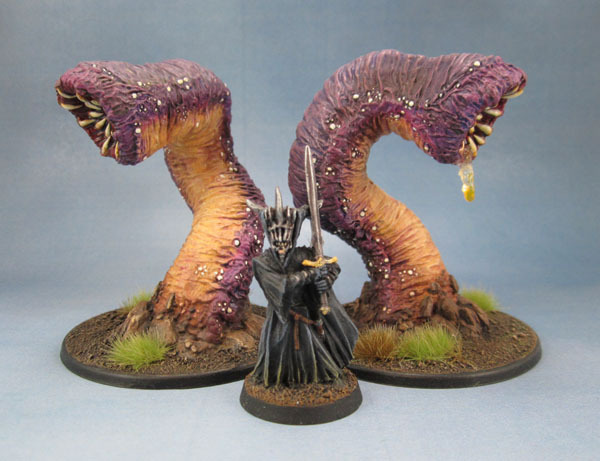 The Mouth of Sauron provides scale for the Great Purple Worms. 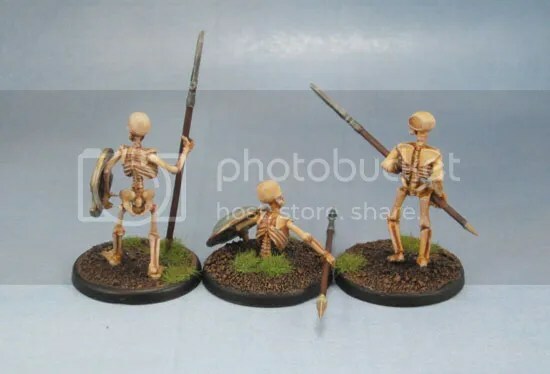 Anyway, both figures were reasonably quick and easy to paint, and the various blending of tones was fun and turned out pretty decently as well. 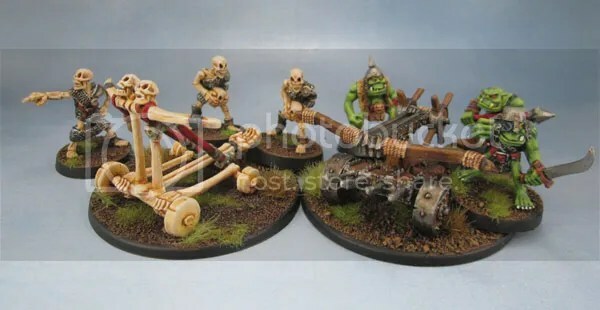 Now it’s back to those bloody goblins! Yet More Goblins on the WIP desk. Dwarf Slayer (Finally identified him – he’s a Daemon Slayer circa ’96-97). 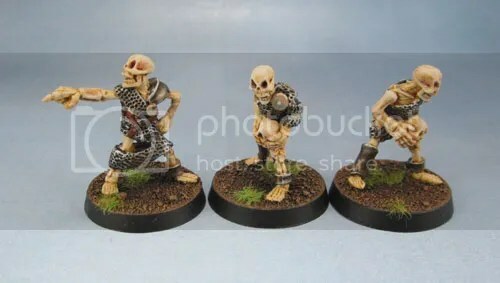 Those last two Metal Moria Goblins to be used as Captains and Unit Leaders (Spear, Sword). Perhaps the odd Biggit. 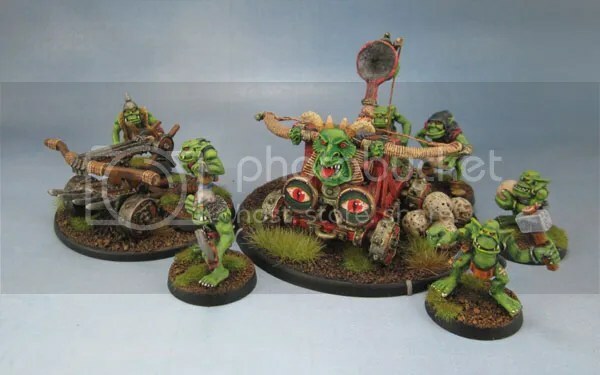 7 more Metal Moria Goblins for use as above. 4 Bows, 1 spear, 2 swords. 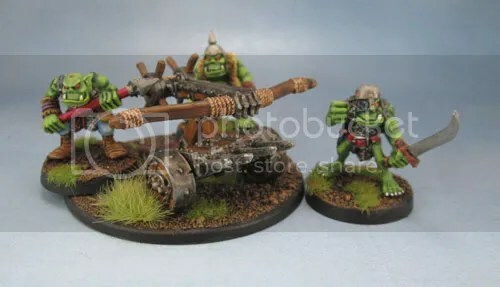 4 Goblin Prowlers. They’ll combine with the other three to make a unit. Shame I can’t find another one, cheaply. 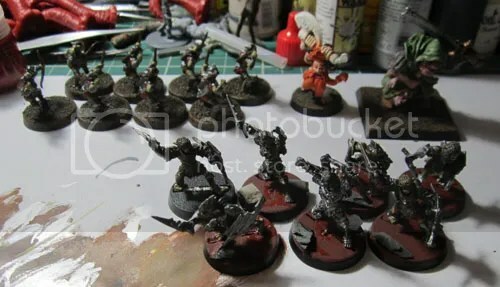 6 plastic goblins with sword & shield. 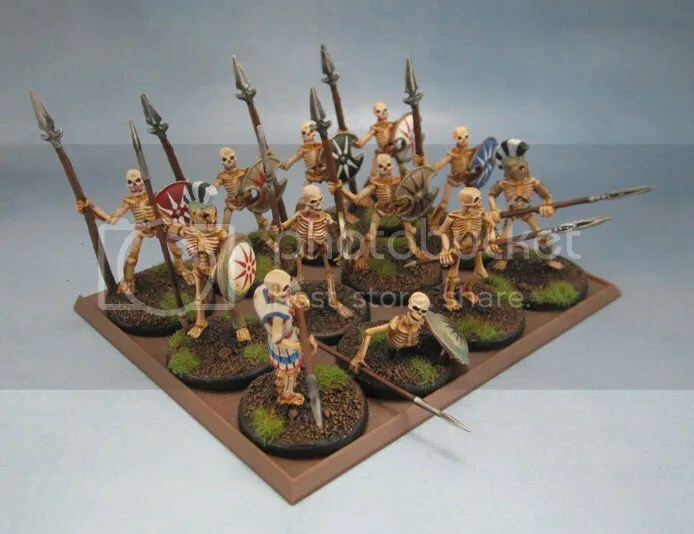 10 plastic goblins with spears. Durbûrz, Goblin King of Moria. Tom Bombadil (GW) and Lady Geneve of the Council of Seven, Speaker of the Far Stars (Red Box Games) – to be painted and used as Goldberry. So… 36 models. The goblins shouldn’t be too hard, but the more individual characters might throw up a bit of a difficulty. I’d wanted to paint something nice on my break as a reward to myself for my recent productivity. Perhaps a Minotaur or the Greek Talos. 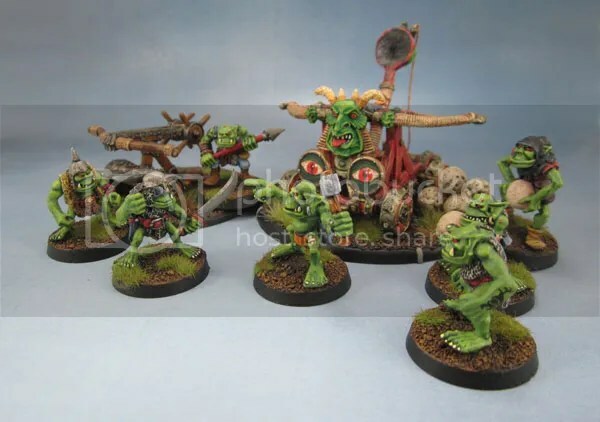 Instead, I’m going for more goblins. 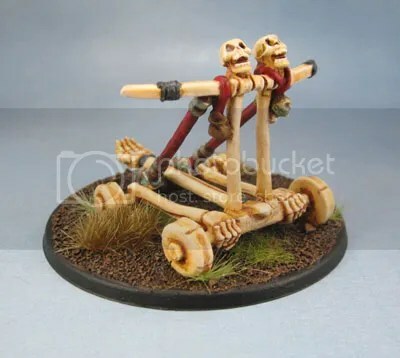 I guess the reward there is getting a ton of them done and out into the War Room as a very quickly put together starter KoW army. 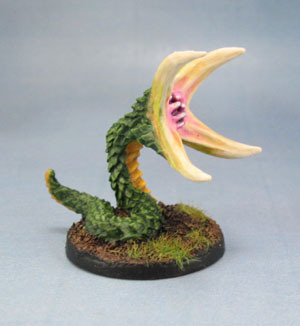 *Thanks to Tarmor for IDing the D&D critters – I’m not especially familiar with the D&D menagerie of exotic monsters. 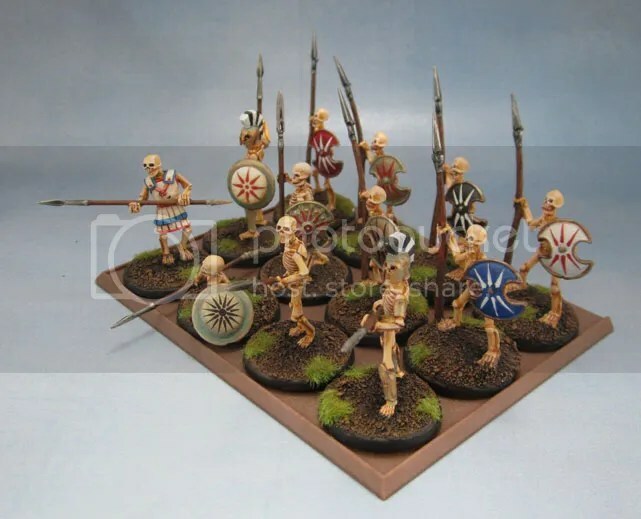 The second unit for the Mythical Greek army is the one shown below – made up of Reaper Bones Skeletal Spearmen and the starts of the show – the other half of the Wargames Foundry Greek Mythology Skeletons range. “Children of the Hydra.” Unfortunately, the whole range is made up of only 10 models across two blisters – 4 with spears and 6 with swords. Within that only a few of them look distinctly Greek, so with 6 models needed to fill out the regiment, I decided to look elsewhere rather than order another pack from Foundry (I prefer fewer doubled-up figures, anyway). Their sister unit, armed with swords was finished some time ago, as was most of this unit, but some recruiting issues drew finishing this lot out for longer than I’d hoped. Wargames Factory Plastic Skeletons join the Wargames Foundry Metal Skeleton. 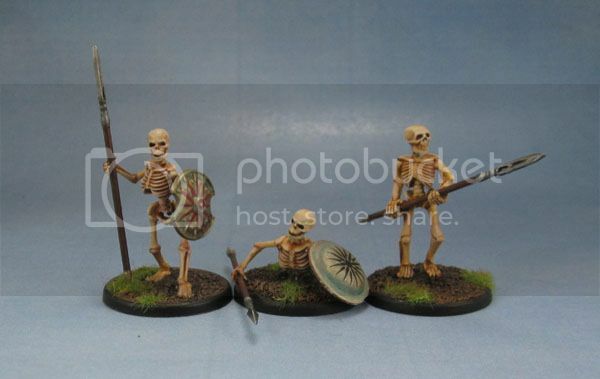 In the end to fill out the missing two in the ranks, I again turned to the Wargames Factory plastic skeletons. They’re already Greek-themed to an extent, which is great. 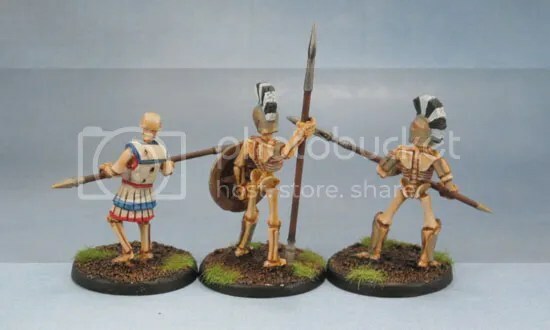 My only concern was how fine they are, and as such are very susceptible to breakage as wargaming figures – especially with spears sticking up everywhere. Still, with these guys towards the middle it should be fine. Again WGF comes to the rescue of the WGF-dominated unit. 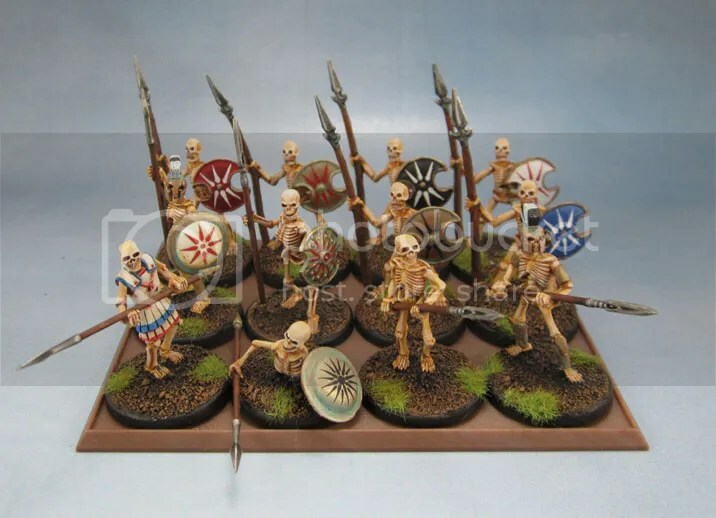 In the end, I decided against adding shields to the skeletons bracing their spears – mostly because there was no easy and effective way to attach them that would still look good. A bit of a shame, but c’est la vie. I went with the one skeleton coming out of the ground to help invoke the whole Jason and the Argonauts thing. A classic from our youth, (even if it was made before many of us were born, it was often shown late on Saturday Mornings here, as well as when VHS arrived. 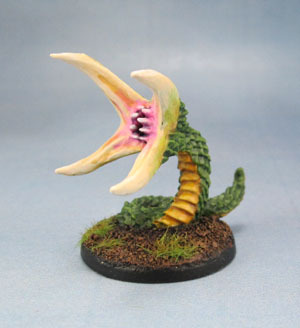 The Hydra’s Teeth – Spear: Finished! Their “good” side. Showing off their shields a little better. 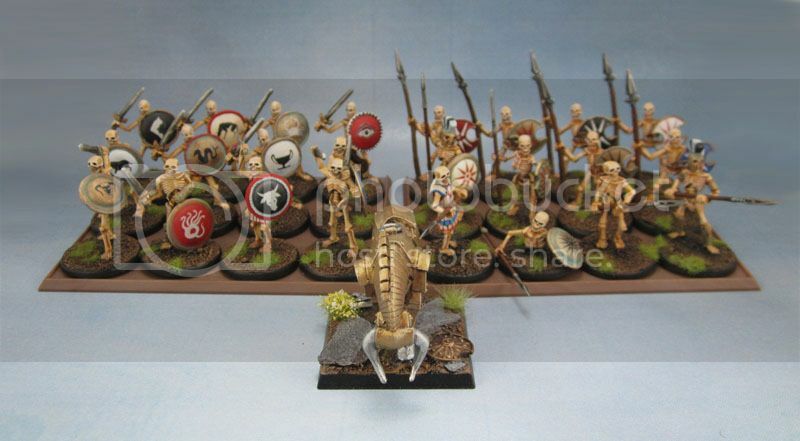 And finally, an army shot of the Mythological Greeks so far. 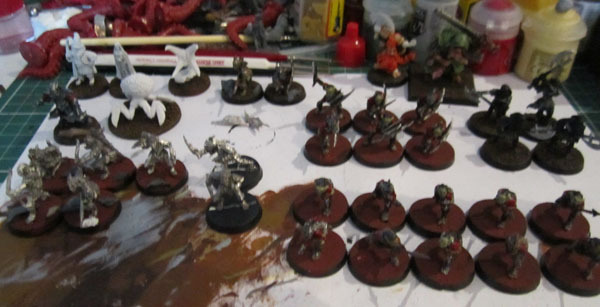 Not a whole lot yet, but it shows the two units of Skeletons along with the Bronze Bull painted earlier this year. The Mythical Greek Army begins to take shape.